The balance of workplace location is shifting toward a private environment. The Internet has revolutionized technology in a way that lets us customize our work surroundings and be independent from any particular place. This loss of constraints is a luxury. Whereas some people opt to keep their office strictly on their laptop and spend their life as working nomads, some decide to bring the work into the most intimate environment imaginable – their own household. If you count yourself among those people, here’s what it takes to design your small home office. If you have a household that sports enough room for an office (for the sake of argument, we’ll presume that you do), there are a couple of important initial factors you have to consider. First of all, the extra space has to be a normal room. You can’t squeeze your entire office into a windowless closet and hope for the best. You won’t be able to perform normally since you are bound to feel claustrophobic. Likewise, in case your work requires you to see your clients, your office has to reflect a modicum of respectability. Space is important, don’t be stingy on it as you setup your home office. It’s also crucial to consider “home traffic”. In other words, you don’t want other household members walking through your office all the time and pacing about. Try to reserve one corner of your household for it, as far from the living room and kitchen as possible. As far as the setup and arrangement of furniture go, the examples online are overwhelming and it is advisable to start there if you lack inspiration. Corkboard is a desirable addition to any office since it can help you keep track of your work and schedule. 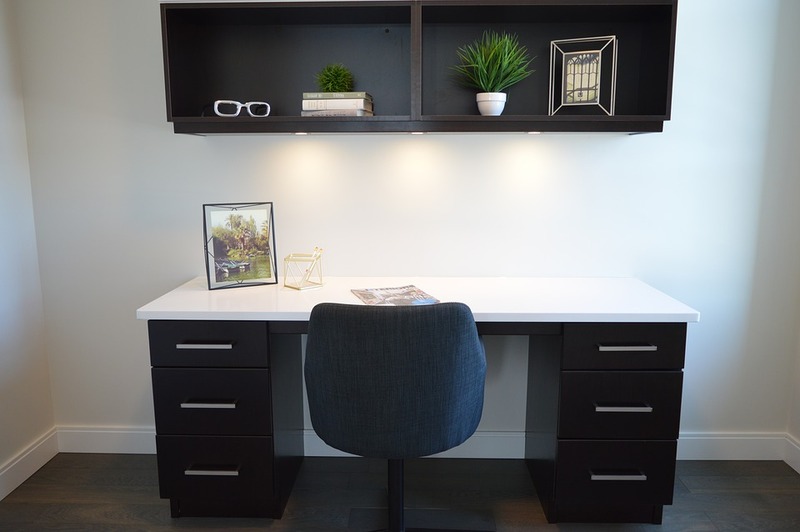 However, you should not set up your home office so your work desk is looking at it – it’s a mistake many first-time home office arrangers make. In fact, the corkboard should go on the wall behind your office desk and you should turn your view towards the windows. It would be fantastic if your office has found its home in a well-lit room. Natural light works much better when you want to relax your eyes and avert your gaze from the computer. If, however, the room is windowless, put an additional lamp on your desk and several tall lamps in the corners. This way, in a well-lit office, you will be less prone to headaches from the eye strain. If there is nothing in front of you but a wall, hang a sizeable painting or a photograph that’s calming and inspiring. People could argue that small customizations have become a regular option for any employee at any “official” office. However, there are particular tweaks only your own household allows. For starters, you can paint the walls in your preferable color, though it is advisable to keep the color combinations in accordance with the work you are doing. Picture frames, little figures for your desk and affordable rugs that will tie the room together are additional details you can add at home and they can work to your advantage. As far as the choice of style goes, everything is fair game as long as it’s consistent across the room and doesn’t compromise your professional appearance. As far as the psychology of the office goes, the chair behind your work desk is a centerpiece that determines how both you and your potential clients and visitors might see you as a professional. You can be stingy with other elements and furniture in the office, and borrow things from other parts of the household to set it up, but there’s one thing you should put your investment in and that’s a comfortable, ergonomically-correct chair that communicates confidence and reliability. At the end of the day, don’t forget the most important thing about your home office – it’s your own kingdom. The fact that you’ve married your home and your work should give you a sense of confidence like never before. It gives you a chance to combine responsibility and comfort, so make the best out of this opportunity.